The IIMS publishes a regular monthly electronic News Bulletin that carries up to date information about Head Office activities and initiatives as well as news, details about forthcoming and recent events and current affairs from around the international IIMS family. All monthly News Bulletins can be viewed in pdf format. We all love to knock new technology it seems don’t we? For many of us, technology can be something of an Achilles heel and because we do not understand it, we go slightly negative and on the defensive! 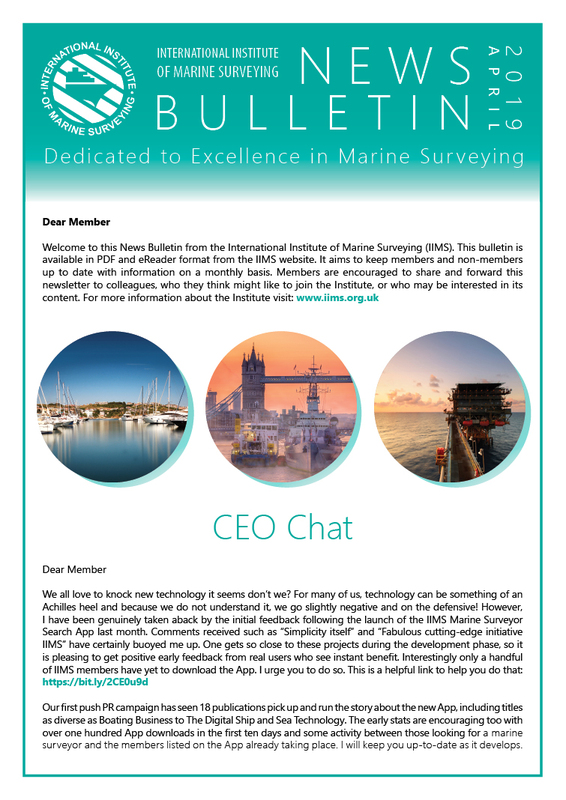 However, I have been genuinely taken aback by the initial feedback following the launch of the IIMS Marine Surveyor Search App last month. Comments received such as “Simplicity itself” and “Fabulous cutting-edge initiative IIMS” have certainly buoyed me up. One gets so close to these projects during the development phase, so it is pleasing to get positive early feedback from real users who see instant benefit. Interestingly only a handful of IIMS members have yet to download the App. I urge you to do so. This is a helpful link to help you do that. Our first push PR campaign has seen 18 publications pick up and run the story about the new App, including titles as diverse as Boating Business to The Digital Ship and Sea Technology. The early stats are encouraging too with over one hundred App downloads in the first ten days and some activity between those looking for a marine surveyor and the members listed on the App already taking place. I will keep you up-to-date as it develops. 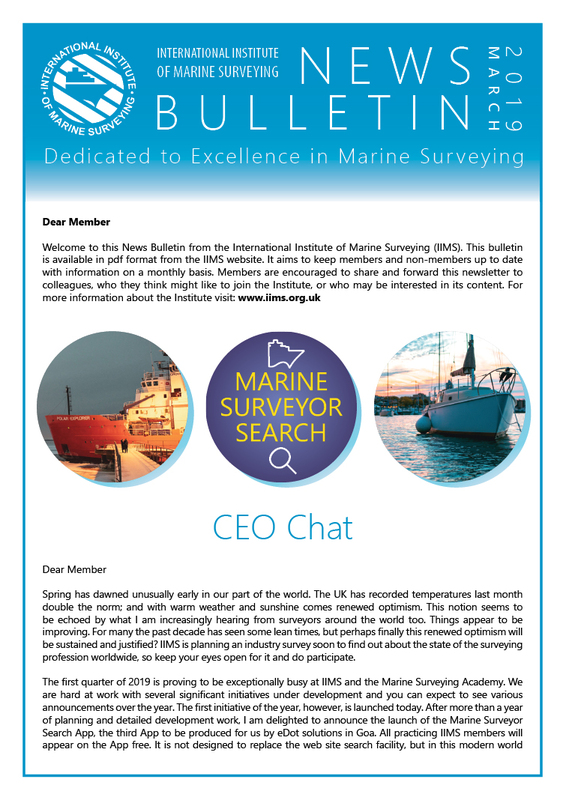 View the bulletin to continue reading: IIMS News Bulletin April 2019 (pdf format) or click to read it in eReader format. 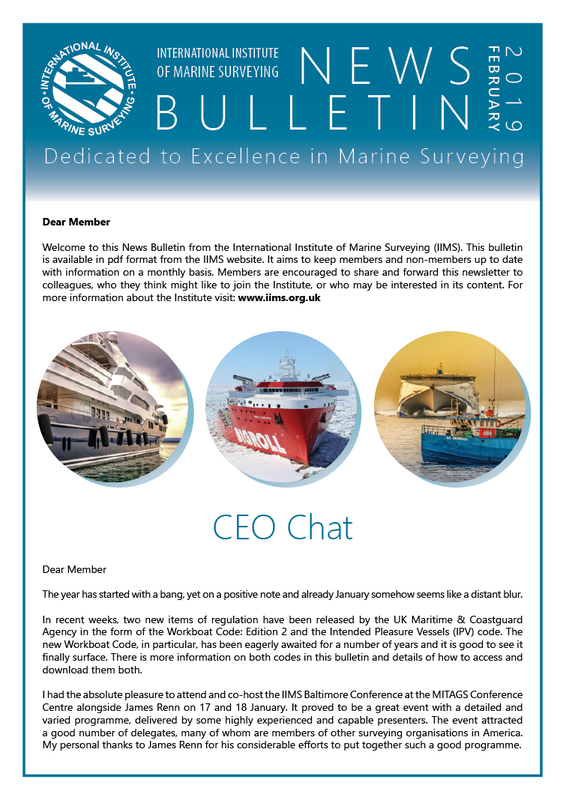 The first quarter of 2019 is proving to be exceptionally busy at IIMS and the Marine Surveying Academy. We are hard at work with several significant initiatives under development and you can expect to see various announcements over the year. The first initiative of the year, however, is launched today. After more than a year of planning and detailed development work, I am delighted to announce the launch of the Marine Surveyor Search App, the third App to be produced for us by eDot solutions in Goa. All practicing IIMS members will appear on the App free. It is not designed to replace the web site search facility, but in this modern world where people use many methods to find the information they need, it offers another essential marketing route for surveyors to allow potential clients to find you. I would urge you to download the App and check your listing to ensure it is correct and as you wish it to appear. The launch of this exciting new App is being backed by a substantial PR campaign to the marine industry. And finally, The Report Magazine has been published today and is available to read online as a pdf or in eReader format at . I recommend you to access the 88 page publication and have a read. There are some fascinating articles covering a variety of surveying subjects. View the bulletin to continue reading: IIMS-News-Bulletin-March-2019 (pdf format) or click to read it in eReader format. Two new items of regulation have been released by the UK Maritime & Coastguard Agency in the form of the Workboat Code: Edition 2 and the Intended Pleasure Vessels (IPV) code. The new Workboat Code, in particular, has been eagerly awaited and it is good to see it finally surface. There is more information on both codes in this bulletin and details of how to access and download them both. I had the absolute pleasure to attend the IIMS Baltimore Conference at the MITAGS Conference Centre alongside James Renn on 17 and 18 January. It proved to be a great event with a detailed and varied programme, delivered by some highly experienced and capable presenters. The event attracted a good number of delegates, many of whom are members of other surveying organisations in America. My personal thanks to James Renn for his considerable efforts to put together such a good programme. The IIMS social media channels are worth checking out having had a lot of fresh content added in recent days. We have published 30 new videos to the IIMS YouTube Channel – all freely available. In addition, there are now 44 audio podcasts available to listen to as you ‘Train as you Travel’. View the bulletin to continue reading: IIMS-News-Bulletin-February-2019 (pdf format) or click to read it in eReader format. 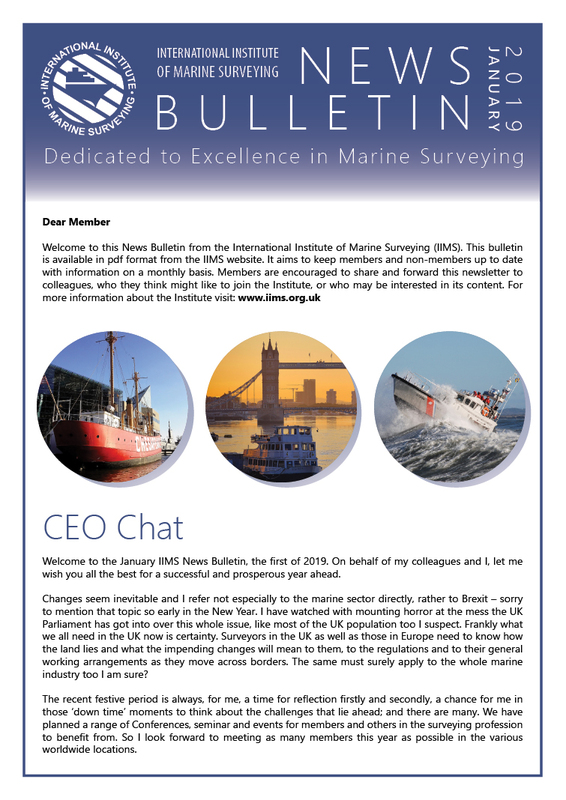 Welcome to the January IIMS News Bulletin, the first of 2019. On behalf of my colleagues and I, let me wish you all the best for a successful and prosperous year ahead. Almost immediately upon us is the IIMS Baltimore Conference on 18/19 January in North America. James “Randy” Renn has lined up a special looking range of speakers this year across the two days for your benefit. It is worth a look – click here for details of the programme and how to join as a real time or online only delegate. After a gap, the IIMS London Conference takes centre stage this year once again, being held on 17/18 June. Put this date in your diary now and prepare your travel plans in good time, especially if you need a VISA. The Conference Dinner will take place on Monday 17th June and the AGM on the afternoon of Tuesday 18th June commencing at 14.00. For distant members, the Conference and AGM will be broadcast online. View the bulletin to continue reading: IIMS-News-Bulletin-January-2019 (pdf format) or click to read it in eReader format.